The palace ticket includes a free audio tour guide, which is a great way to learn more about what you're looking at in each room. We went a bit late in the day, and the palace closes early in the winter, since it becomes too dark to visit the gardens and abbey outside, so we did have to rush around a little quicker than we would have liked, but I was still able to listen to each section of the guide. The tour starts in the courtyard in front of the palace, pointing out the fountain, and explaining that the north west tower on the left of the palace is older than the right side. 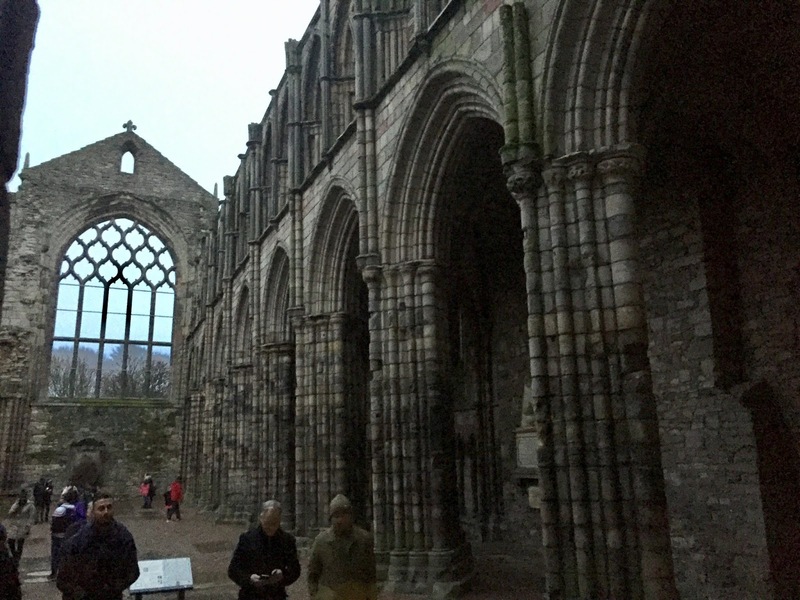 Holyrood started out with the abbey, built in the 12th century by King David I, which now lies mostly in ruins. The earliest palace was built by James IV at the beginning of the 16th century, and was added to by his son, James V, including the north west tower. The current layout of the palace mostly dates from the 17th century, during Charles II's reign, when it was reconstructed by Sir William Bruce. Inside the palace (photography is not permitted), the tours moves through many important state rooms, including the dining room, throne room, drawing rooms, and the king's bedchamber. 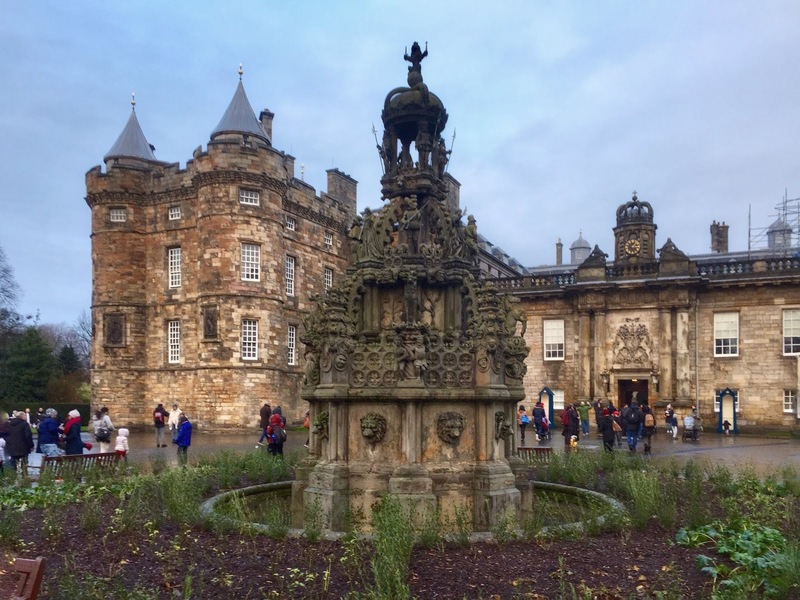 The latter also contains portraits of King James VI, Charles I, and Charles II, the first Scottish rulers to also be kings of England. These rooms once served as the processional route for visitors coming to see the king, who would progress further through them towards his bedroom, where only the most important visitors could meet him. Their order was reversed, with the throne room now at the beginning, from George IV's visit in 1822. The rooms are lavishly decorated with paintings and tapestries, many of them centuries old, including the king's bed (purely decorative, it wasn't actually slept in). The Queen takes up residence in Holyrood for one week each summer, and has also greeted important visitors in these rooms, including the Pope. Beyond the king's rooms, you reach the Great Gallery, a long corridor containing 110 portraits of Scottish monarchs. It starts with the legendary, Fergus I who was thought to have ruled in 330BC. The early monarchs are simply legends, and history usually says that it was Kenneth I who united the Celtic tribes into Scotland in 843AD. These portraits were commissioned by Charles II, and painted by Jacob de Wet II, to illustrate the Stuart kings' lineage. The Stuarts have the largest portraits in the room. Many of these were damaged by Hanoverian troops during the Jacobite uprisings, but have since been restored. The room also contains other artefacts, including the jewels of the Order of the Thistle. This room was also used as a ballroom by Bonnie Prince Charlie, when he briefly took up residence here in the 18th century. Portraits of him can be found in the next room. The north west tower is one of the most dramatic parts of the palace. 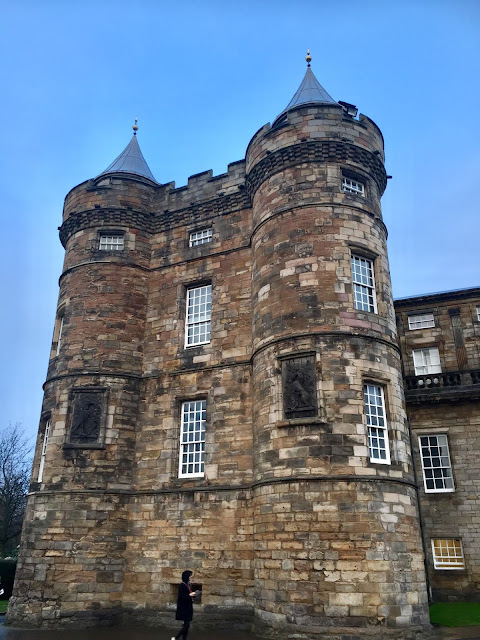 First you'll see the Queen's Bedchamber, which was once occupied by Lord Darnley, the second husband of Mary Queen of Scots. The bed here is kept inside glass casing to protect it, and was the one he actually slept in, while the two lived here in the 16th century. This room then has a narrow spiral staircase connecting it to Mary's bedchamber upstairs. 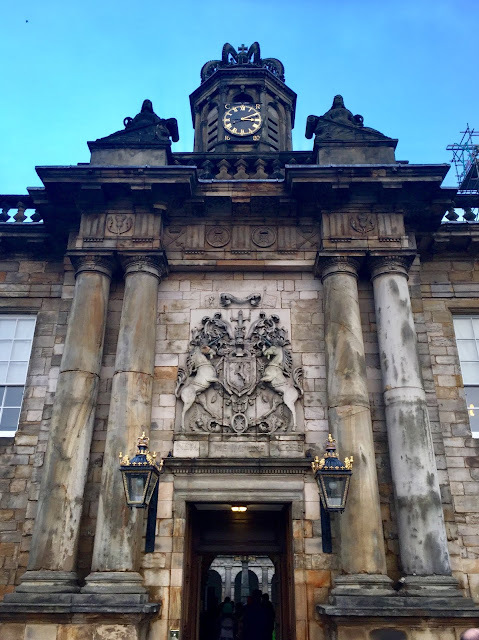 She is one of the most famous Scottish monarchs, and most famous residents of the palace (her son would move to London, to become James I of England, as well as VI of Scotland). It was in the small supper room next to her chambers that Darnley and a group of accomplices attacked her Italian secretary, David Rizzio, in a fit of jealous rage. Rizzio was dragged to the outer chamber and ruthlessly murdered! These events set in to motion Mary's downfall, leading to her abdication, imprisonment, and execution at the hand of her cousin, Elizabeth I of England. The outer chamber now contains many jewels and other items that were once Mary's or Darnley's. The tour then guides you outside the palace, to the gardens at the back. 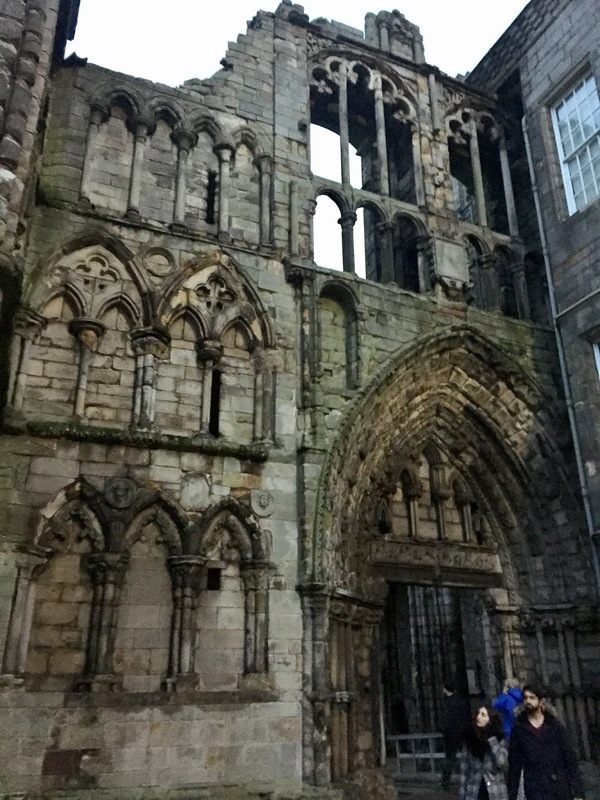 We were unable to see them that day, as they were already closed, it being dark at 4pm during the Scottish winter! 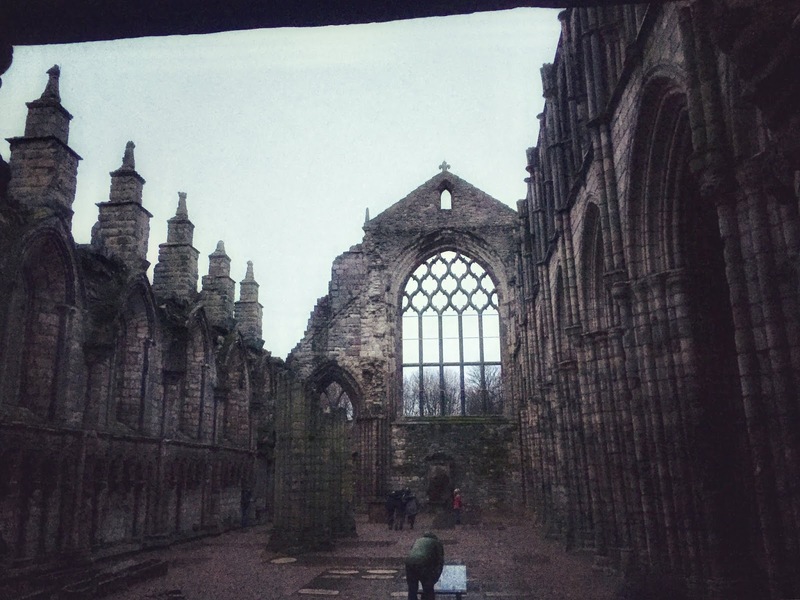 Then, there is the oldest part of the whole thing, Holyrood Abbey. 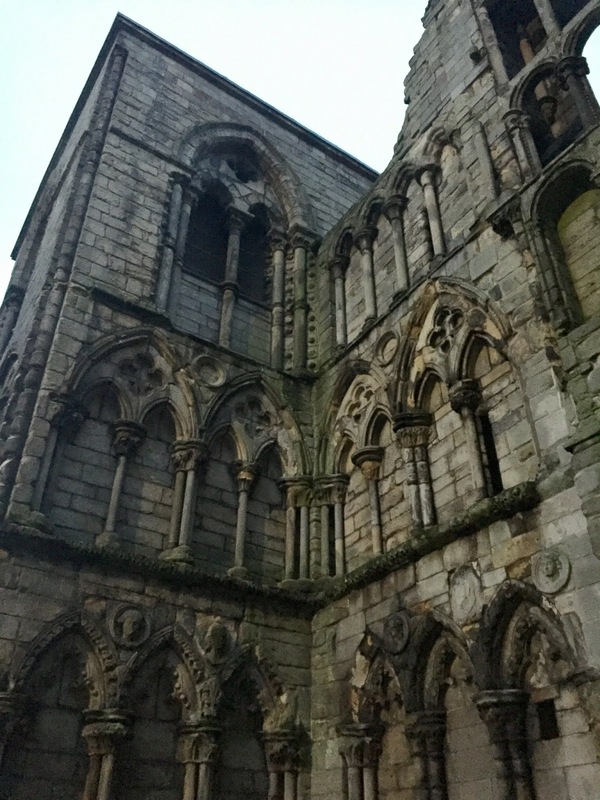 It was built by King David I after, legend says, he was attacked by a stag while hunting, but a cross (a 'holy rood') came down from the sky, startling the stag and saving the king. He founded the abbey in thanks. 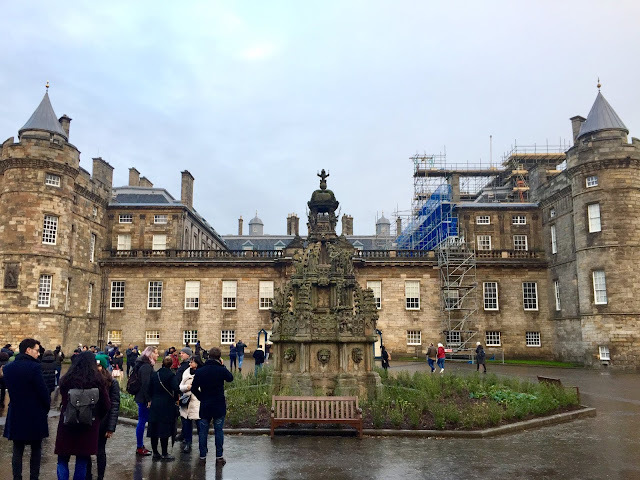 It was the site of royal weddings, burials, coronations, and parliament meetings over the years, and was once the chapel for the Order of the Thistle (their current one is in St Giles' Cathedral). However, eventually much was destroyed in the Glorious Revolution in 1688, and it fell into ruin after, as it was no longer used much by the royals. Canongate Kirk had also replaced it as the parish church for the burgh, including the palace. You can still see how impressive the building once was. We couldn't enter, as they were starting to close, since it was already getting dark, but we were at least able to stand at the entrance and take a few photos looking inside it. I feel like I get far more out of visiting these sorts of sights than I used to, in part I think just because as I've gotten older, I've taken more interest in them. But also, working as a tour guide and having to know a lot about Scottish history means that I have more context for these locations, and I'm always seeking to expand my knowledge now. So I'm very glad to have been able to visit again, and although our tour was quite a fast one (next time we'll go earlier! ), I definitely feel like I was able to appreciate it more this time round!